The Anterior Cruciate Ligament is the ligament that keeps the knee stable. ACL is one of the four main ligaments in the knee that connects the femur to the tibia. The knee is normally a hinged joint that is held together by the medial collateral (MCL), lateral collateral (LCL), anterior cruciate (ACL) and posterior cruciate (PCL) ligaments. ACL injury is generally caused during the sports are when a person is hit to another person or a strong object on the knee. The injury can occur when the foot is firmly planted on the ground and a sudden force hits your knee while your leg is straight or slightly bent. Anterior Cruciate Ligament damage is a very common injury, especially among athletes. ACL injuries can be categorized into groups- contact and non-contact based on the nature of the injury Contact injuries occur when a person or object come into contact with the knee causing the ligament to tear. However, non-contact tears typically occur during the following movements: decelerating, cutting, or landing from a jump. ACL injury is 4-6 times higher in females than in males. Why is ACL surgery necessary? 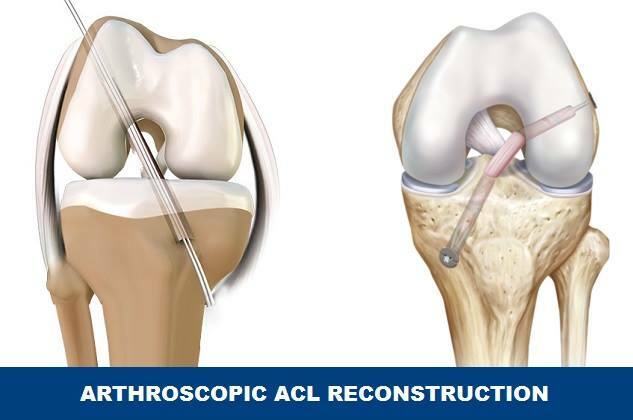 ACL tears are not generally repaired and sewed back together, because repaired ACLs have generally been shown to fail over time. Therefore, the torn ACL is generally replaced by a substitute graft made of tendon. What problems you may face if your ACL gets torn? The patient suffering from ACL injury often have difficulty in walking. It can also cause loud poping sound of knees as the ligaments tear,including knee swelling and pain. How ACL Surgery is done? Arthroscopic ACL Reconstruction is done via key-hole surgery, wherein the torn ACL is reconstructed using a graft. This graft is extracted from your own body. Hamstring Tendon graft is the most common graft used. These tendons are dispensable and cause no long term side effects. Small tunnels are drilled in bone to place the graft in the anatomical site of ACL. How is post-op recovery after ACL surgery? Some physical therapy under the guidance of physiotherapist guidance will help to regain the flexibility of the ligament, it will prevent the breaking of the tissue and will help in strengthening the muscle tone. Approximately 4-6 weeks is required for the bone to attach to the graft. However, patient can start their normal activities like walking on their own and do some exercises under proper observation and care. Famous Sportsman who have underwent ACL Surgery?